NOTE: As of April 20, 2012, Miniburger switched its name to KrushBurger. 6 a.m. was pretty early to be eating burgers, but I wasn't about to turn down an opportunity to be one of the first to sample the burgers from the new Mini-Burger Truck (MBT). I was up early for their spot on News 10 Good Morning with reporter Kate Larsen. 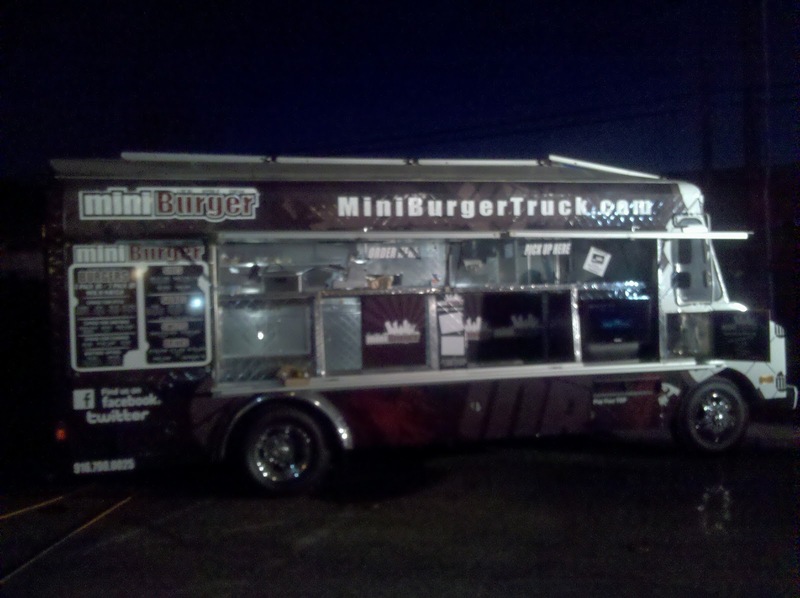 Today marks the public debut of the truck at Niello BMW Mini (off of Fulton) from 11-7. It also gave me the opportunity to promote our Sacramento Mobile Food Truck Festival (SactoMoFo) coming April 30th. I met owner Davin Vculek and his chief burger chef, Sam, on their truck. It was still pre-dawn, but Sam was already cooking up a few items for us to sample. Davin explained that they refurbished a 70's era food truck and have placed equipment in it so that they can move from place to place and still keep the grill hot. The deep fryer has a latch lid. Off to the side is a slicer to slice real cheese. There are no microwaves - another difference between gourmet trucks and roach coaches. Remember, gourmet truck food is made-to-order from fresh ingredients. Roach coaches are just reheating prepackaged, and selling pre-prepared food. The beef they use is from Five Dot Ranch, local, and is used by other restaurants in the area. They also have buffalo and chicken breasts. Their buns come from Grateful Bread and their produce is all local too. They gave us some samples to share of the OG, which is a basic cheeseburger with a little bit of grilled onion, and the Ninja, which has Asian slaw, lotus chip, jalapeno, and Srirachi aioli. The Ninja has a bit of a kick, but not that much. I'd consider it mild. What I was impressed with was that these really were mini-burgers that were thick, juicy, and medium rare - just the way I like them. Sam scoops out the beef with an salad scooper so that they are all the same size. Then they mash them down with press. This makes it a quick process. From their sides I really liked the sweet potato tots seen above. They were perfectly crunchy on the outside and soft on the inside. A definite side order request for me on my orders. 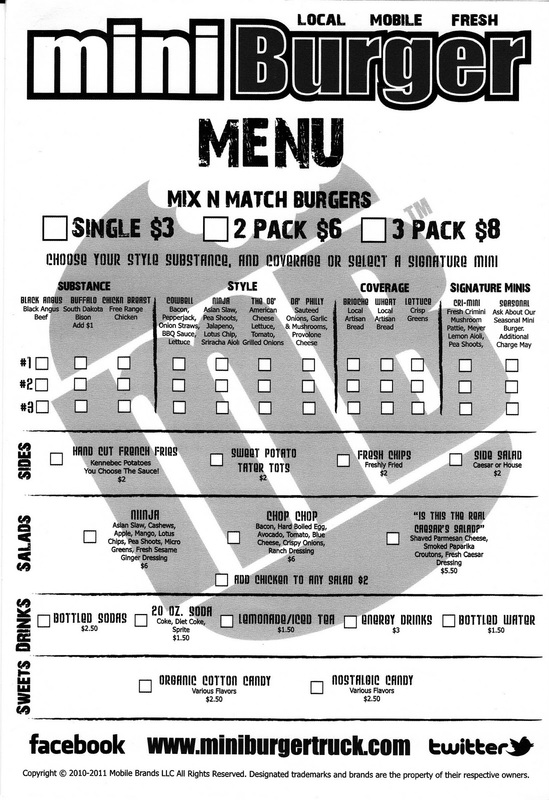 Here is the menu that is filled out with your choices. I believe Davin says that the customer fills it out and then hands it up to the window, again, speeding up the process. After all, with the current laws in place, MBT will still have to move locations every 30 minutes within the City limits. Davin plans to have another truck in operation in a few months. 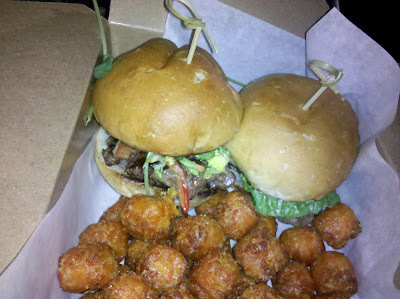 Let's all keep our fingers crossed for him as he pioneers the gourmet truck biz in Sacramento. Note: This review was written before I developed a working relationship with Miniburger.